Oh yeah. Homemade Nesquik coming right up. Want to know something about Chocolate Milk? Nobody needs it. It’s not a health food. We probably shouldn’t drink it. 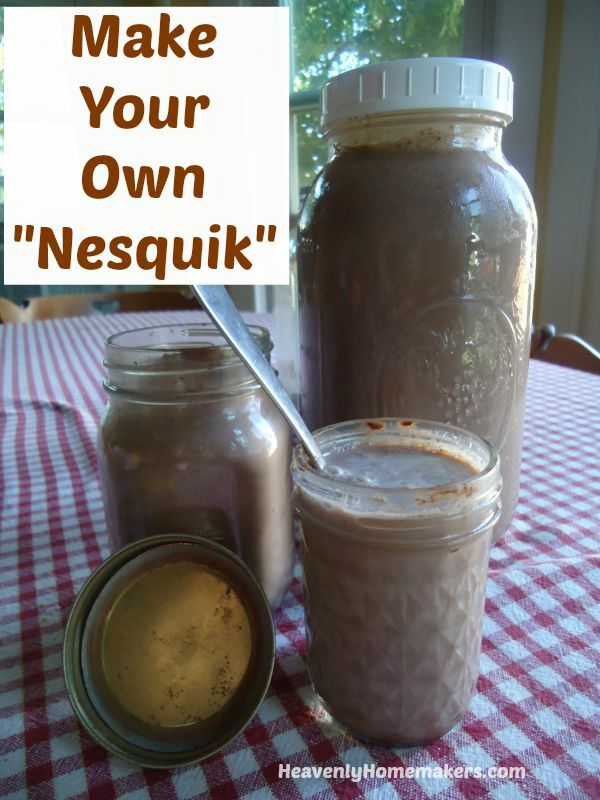 Yet I still have a homemade “Nesquik” recipe to share with you. Why? Because it’s fun, because it’s tasty, and because some people love their chocolate milk. So if you at least had an option to drink a healthier version of chocolate milk, wouldn’t that be nice? INGREDIENTS: SUGAR, COCOA PROCESSED WITH ALKALI, SOY LECITHIN, CARRAGEENAN, SALT, NATURAL FLAVOR, SPICE. VITAMINS AND MINERALS: SODIUM ASCORBATE (VITAMIN C), FERRIC PYROPHOSPHATE (IRON), NIACINAMIDE, ZINC OXIDE, THIAMIN HYDROCHLORIDE, COPPER GLUCONATE, MANGANESE SULFATE, BIOTIN. What’s with all that stuff in there? If you can possibly imagine, I just learned to make a chocolate milk mix with the simple yet magical ingredients I like to call cocoa and sugar. For real? Are we sure we can have our chocolate milk without adding some niacinamide? Because I just don’t know. Put all ingredients into a pint sized jar. Put a lid on and shake the ingredients until they are well mixed. To make chocolate milk, add 1-2 Tablespoons of mix to a 12 ounce glass of milk. And that’s it. Making Homemade Nesquik will take less effort than finding your missing shoe. What’s your relationship with chocolate milk? Mostly. ;) I had to whisk it at first, then it dissolved just fine. I’ve been making my own chocolate mix and hot choc. for years. I now use stevia and half regular and half dark chocolate cocoa powder. Also have a jar with added powdered milk for a really lazy cup of hot cocoa. Thanks for the link to organic cocoa powder ?. Still looking for a good instant chai mix……. Combine all ingredients except the honey in a pot. Add 2 cups of water and bring to a boil over medium-high heat. Lower slightly and let simmer for 5 minutes. Turn off the heat and let steep for 5 minutes. Remove the teabags, squeezing out any liquid from them. Let the spices steep for another 15 minutes. Strain, removing all the spices. Add the honey and stir in. Taste, adding more honey if you like. The concentrate is easily doubled and will last a while in the fridge. We love this–I always add the mix to a wee bit of hot tap water to get it to dissolve well before adding the milk. We had occasional clumps before, which bothered the kids. With the water, it’s super smooth! Thanks I have been using Cocoa and sugar to make my own Hot Cocoa and wondered if I could make it ahead like this. Do you use the same amount of sugar as the sucanat? When I make hot cocoa if I have half and half or whipping cream I add a little of that too. Makes it more creamy. Love it. Thanks so much. Thanks for this! We make a hot chocolate mix to give as Christmas gifts and my husband drinks it exclusively during the winter months. We just bought all the stuff needed to make a huge batch for him to take on his upcoming deployment overseas. We use Nesquick in our recipe, but in the future, I will be using this!! I might try and return one of the BIG containers of Nesquick that we bought and make our recipe with this substitution. :) Thanks again! Please extend our gratitude to your hubby for his service! Sending up prayers for a safe trip to and fro, and for the family that will be loving and missing him! May he return home BEFORE his chocolate mix runs out!!! 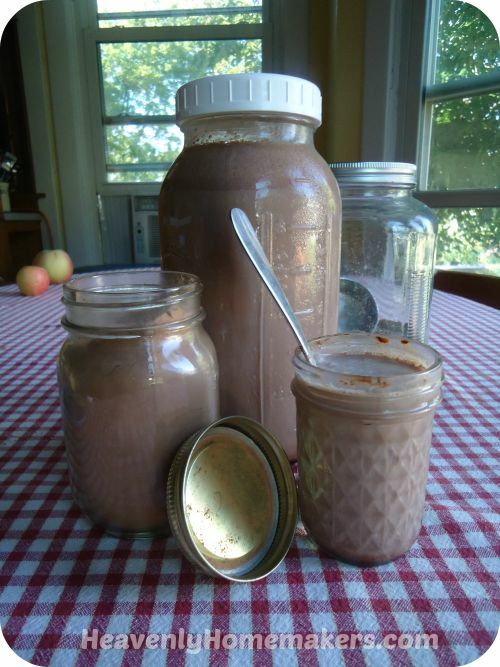 I have been making chocolate milk by making a ‘chocolate syrup’ of sorts by mixing cocoa powder and real maple syrup. We get raw milk from a local farm and so have half gallon jars in our fridge all the time. I mix up a whole jar of it at a time–just needs a good shaking before pouring. Best chocolate milk I’ve ever had! Susan, that sounds really good! We tap maple trees in the spring so always have a good supply of maple syrup. Will definitely give this a try. Thanks for the idea. ? Love this recipe! Thank you Laura! Running the sucanat through the blender to powder it first helps it to dissolve better in the milk. Perfect timing, as I am almost to the bottom of my huge container of Nesquik! I drink a glass of chocolate milk almost every morning. I just cannot eat early, so drinking this puts something into my stomach AND makes me very, very happy! I consume very little “junk”, so no guilt, just smiles!